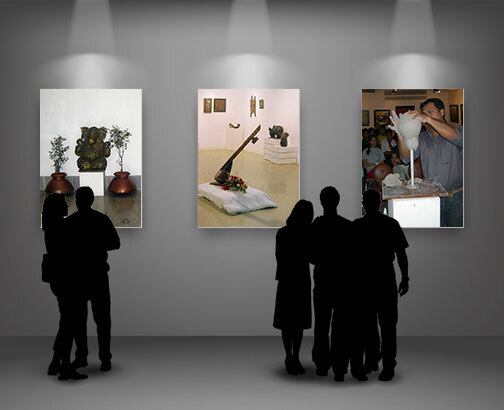 Kamalnayan Bajaj Hall and Art Gallery® is an initiative of the Jamnalal Bajaj Seva Trust of the Bajaj Group. Situated in the financial hub of India, Kamalnayan Bajaj Hall and Art Gallery is a landmark at Nariman Point, in south Mumbai. The Hall, a multipurpose venue, hosts social, cultural, educational, commercial, and literary events. The Art Gallery facilitates aspiring and established artists to exhibit their creative expressions. The endeavour strives to promote the spirit of the art and its appreciation. The venue was set up in 1980 in the memory of Kamalnayan Bajaj, a philanthropist, industrialist, multifaceted human being and an ardent promoter of art, culture and literature. Kamalnayan Bajaj was the elder son of Jamnalal Bajaj, a freedom fighter, social reformer, humanitarian and a devoted follower and adopted fifth son of Mahatma Gandhi.